Written by on Wednesday, 21 March 2018. Anything in a bowl is on trend now. Here's a favourite dietitian Sophie Feng has created based on salmon - you choose whether you go with the raw or the cooked fillets if that's what you prefer and are used to. 2160kJ (514 Calories), 28g protein, 27g fat (including 5g saturated fat), 37g carbohydrate (including 6g sugars), 10g fibre and 595mg sodium. If using raw salmon: Cut salmon pieces into small 1.5cm (1/2 “) cubes. If cooking salmon: Pre-heat oven to 180°C (fan forced) and line an oven tray 30 x 20 cm (12 x 8”) with baking paper. 2. 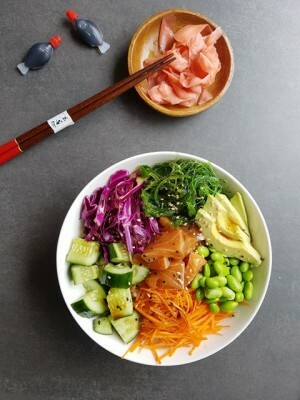 To make the raw salmon marinade, place the soy sauce, sesame oil, rice wine vinegar and chilli flakes (if using) into a medium bowl and mix to combine. If using raw salmon: Add the salmon cubes and gently spoon the marinade over it to ensure every piece is coated. Cover and refrigerate for at least 1-2 hours or up to 4 hours. If cooking salmon: Place salmon fillets on the oven tray and spoon half the marinade over the salmon. Bake in the oven for 12-15 minutes or until just cooked. Allow to cool. 3. Just before you are ready to serve, prepare your vegetables. Dice the cucumber, grate the carrot, finely slice the red cabbage and slice the avocado. 4. To assemble, divide the brown rice between two bowls. Top each bowl with cucumber, carrot, red cabbage, seaweed salad and edamame beans. Remove the marinated salmon from fridge and divide the salmon between bowls OR flake the cooked salmon fillets into each bowl. Drizzle any left over marinade over each bowl as a dressing. 5. Sprinkle each bowl with sesame seeds. Serve with pickled ginger and/or wasabi if you like! Boxes of raw salmon and seaweed salad can be found at your local sushi outlet. Or buy raw salmon from your fish market but make sure it’s super fresh. Edamame beans can be found in the frozen section of your local Woolworths, Coles or Asian supermarket. If you’re short on time or don’t have cooked rice ready to go, try a cup of microwaved brown rice or pre-prepared salad bags (such as an Asian slaw mix) from your local supermarket.